Waldorf Ford wants to remind all of you, as the above quote greatly states, that to go against the grain is to define yourself. We encourage individuality both at the office and at home. It may seem a slight counter intuitive to tell you to be an individual by telling you to be like Henry Ford, but such is a false dichotomy. For the plane not only defines itself as a plane by going against the wind, but also soars. 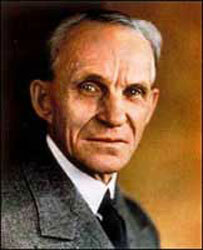 Come back for more quotes by Henry Ford and others about the Ford Motor Company.